First, add all the ingredients to the blender. Blend for 30 seconds. Next, add the molasses, chia seed, and nut butter, and blend again for 10 seconds. Taste and check for consistency. If too thick, add a little more water and puree. If more sweetness is desired, add a bit of honey or a shake of cinnamon. Serve in a fun cup or in a bowl with a spoon for a “smoothie bowl”. Enjoy! Check out the What a Good Eater! 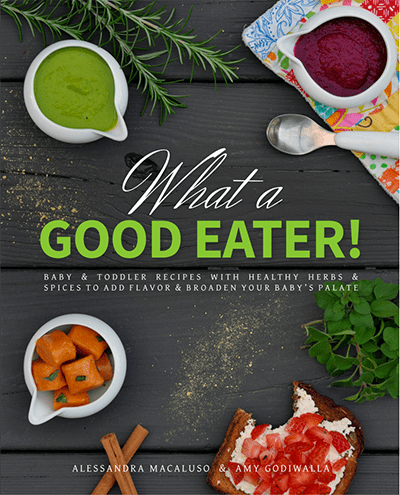 cookbook for fantastic ideas on family friendly meals, more sample food schedules by age, healthy snack ideas by age, and meals ready in about 30 minutes or less for busy parents.